Hubbub - FANTASTIC BEATS: Get In the Pink to the Edinburgh Fringe! We're taking our show to the Edinburgh Festival Fringe, and we need your help! 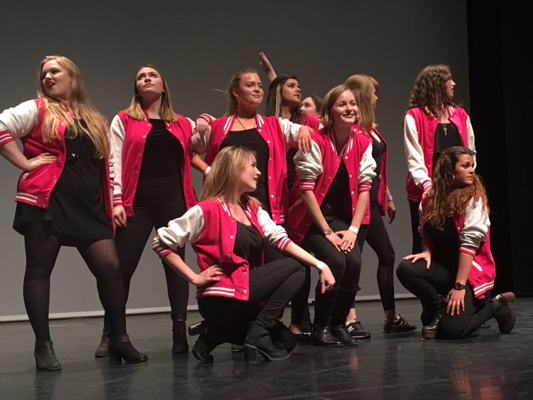 In the Pink are an all-female a cappella ensemble made up of students from Oxford and Oxford Brookes. Formed in 2004, In the Pink has seen many a transfiguration over the years, but this year has has marked a colossal turning point in the energy of the group, who progressed through to the finals of the Voice Festival UK 2017 in large part due to their inspiring Girl Power vibes. In the Pink performing at the Voice Festival UK semi-finals this April. Fantastic Beats will take the audience on a journey through student life in Oxford, searching for the music and the magic in the most everyday of occurrences. After receiving that all-important letter from Hogwarts – or in the girls’ case, from the University Admissions Office – what to do when the daily grind turns excitement into tedium? Fantastic Beats promises to re-inject the magic into the monotonous by seeking out the music in every aspect of student life, from the library to the club. Edinburgh is expensive: besides travel, food and accommodation costs, groups have to fork out for venues, technicians, registration and other administrative fees. In previous years, this has been entirely funded by the girls themselves, retrospectively subsidised, but never covered, by ticket sales. This year, all the girls have already contributed hundreds of pounds each to account for these costs, and you may well have seen us performing at various events around Oxford to raise funds, but we still have a way to go to make the show happen. However, in order for this pledge to be helpful to those most vulnerable, we need to actually make a profit. This rarely happens for student groups at the Fringe due to immense overheads, which your money will go towards covering. We want to make it clear that your donation will NOT directly fund Oxford Against Cutting - rather, it will make it more likely that In the Pink will make a profit from ticket sales at the Fringe, half of which has been pledged to the charity, the other half of which will help to reimburse the girls for travel costs, accommodation during rehearsal week, living costs and other expenses. We've put our heads together and come up with some magical rewards for ALL donations over £5. The more you give, the better they get. How much do you want that In the Pink branded Varsity jacket?! Follow us to find out how we're doing- we'll be doing shout-outs for the duration of the campaign! We would also like to thank our very own Somerville girl, Helena, for facilitating this project, and Somerville College themselves for the use of their wonderful platform, Hubbub. Keep an eye on our Facebook page for more information coming soon! Social media high-five! We'll give you a shout-out on Facebook or Twitter. You will receive a thank you postcard from the Fringe! You're one of us now. Wear the badge. You will receive all of the above, plus a Fantastic Beats button badge! You will receive all of the above, as well as a signed flyer from the Fringe! Let's take it back with some retro In the Pink! You will receive a limited edition copy of our CD, as well as all of the above. You're a star! You will be able to choose from a range of personalised jingles, as well as all of the above. Always coveted our iconic In the Pink baseball jackets? Now's your chance! We will send you all of the above, as well as YOUR VERY OWN official In the Pink jacket! You're a legend. As well as all of the above, In the Pink will perform a live set at your upcoming event. Contact inthepinkoxford@gmail.com for details! (Travel costs not included and subject to availability, disregard August 2017 date).